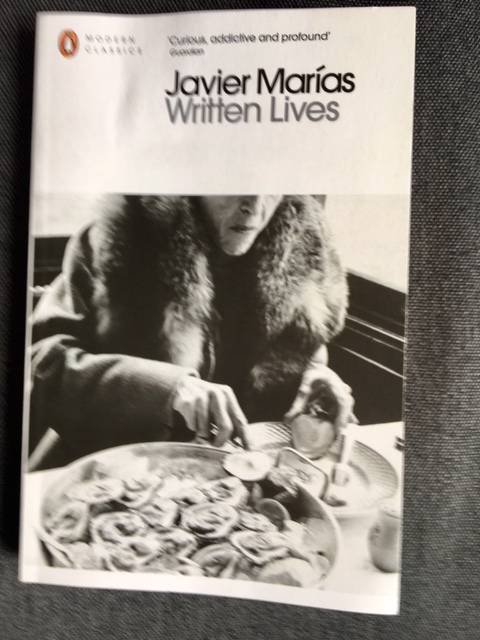 This entry was posted in Spanish literature and tagged Javier Marias, Penguin Modern Classics, Philip Hensher, Written Lives by Simon Lavery. Bookmark the permalink. OK, I think my favorite part of this essay, Simon, is Phillip Hensher’s description of the author’s book jacket photo! I mean, of course, Hensher’s review was acrid. I really enjoyed the book – it’s a hoot, provided you don’t take it too seriously. As you probably know, I am a Marias fan (although I’ve yet to read any of his non-fiction). This sounds like a great book for dipping into every now and again – the sly humour you mention is definitely evident in some of the quotes. I love this book. “Dipping”! I remember blasting through it, having to restrain myself from reading too much at once. You describe it well – its appeal, and what some people will I suppose find irritating. I particularly like writers writing about other writers when they are ‘indiscreet’! You will be pleased to know that there is a collection of Marias’ essays coming out later this year.